A UNITED VIEW ON FOOTBALL: Views from Opposite Ends - Managers unfairly under pressure? Views from Opposite Ends - Managers unfairly under pressure? 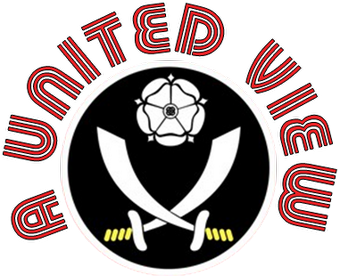 Continuing our Views From Opposite Ends series it is a pleasure to welcome Carlisle United blogger and sometime contributor to the Carlisle United blog Bring Me The Head of Keith Mincher, Mark Donnelly to the pages of A United View. In an interesting game at Bramall Lane today, 5th placed United came face to face with 10th placed Carlisle United. Yet despite relatively positive starts to the season for both sides, there are elements in both club's support waiting for the opportunity to have a go at their manager. From a Blades perspective there are aspects of Wilson's appointment that still rankle with some of the support. Although a majority have accepted Wilson and will back him and the team, you always sense that we are one or two bad results from fans turning on him. Even today, when Evans was substituted for Porter the boos rang out and catcalls of "you don't know what you're doing." Greg Abbott is a slightly different tale. Nearly three years into his reign, he has taken the Blues to the JP Trophy final in two consecutive seasons, winning it last season. He has suggested the team should be capable of reaching the Play Offs, something achieved when he was assistant manager to John Ward. Yet elements of the support see the lack of a top six position an opportunity to criticise Abbott and his perceived negative tactics. So what did we make of the game and each other's teams. First up I'll let Mark give you his view of the game and the Blades. Carlisle made the trip to one of the ‘giants’ of the League 1 this year, with around 1,200 (I would say North of 1,500) travelling Blues ascending on the Steel City. The Cumbrians and Blades both advanced through the first round of the FA Cup last weekend, so were full of confidence coming into this fixture. Both managers kept faith with the sides that defeated Alfreton and Oxford respectively. The hosts started the game brightly, and forced a corner within two minutes of kick off. The ball was cleared, but fell to Lee Williamson, His volley however, flew over from 22 yards. The Blades should’ve taken the lead on 6 minutes. Williamson again tried his luck, this time forcing Collin into a superb save. Richard Cresswell collected the rebound, but volleyed over in front of an empty net. The hosts continued to apply the pressure, and this paid off on 21 minutes, Carlisle loanee Christian Ribeiro was caught with a high foot, but the referee waved play on, and the Blades continued up field and won a corner. The set piece eventually fell to Ched Evans, who hammered home into the roof of the net. The Carlisle fans were rightfully not best pleased, and the players made their feelings know to the officials. This goal perked the visitors up, and Lee Miller had Carlisle’s best chance of the game late on in the first half, but drilled the ball into the side netting. The Blades almost extended their lead in first half injury time. Stephen Quinn had to time to pick his spot, and it took an acrobatic save from Adam Collin to deny him. At half time, the general thoughts in the Cumbrian camp were that we were unfortunate to be behind to the controversial goal, but we were far from impressive. The second half started off at a much slower pace than the first, but sprung into life in the 70th minute. Ribeiro brought down Ryan Flynn in his own box, giving the Blades the chance to double their lead. Adam Collin however, had different ideas. The impressive Collin guessed right to push away Creswell’s penalty. Carlisle found a new lease of life after this, and pushed on to try and find the equaliser. Rory Loy, and then Craig Curran, failed to hit the target. The home side could have added gloss to the score line deep into injury time. Richard Cresswell scuffed his shot from 6 yards out, and Carlisle got let off the hook. It’s probably fair to say that this wasn’t one of the Blades best performances this season and there were no spectacular individual performances. £3million (This will never be the actual fee paid!) man Ched Evans was probably the best player on the pitch, and managed to get himself on the scoresheet. The Blades looked organised at the back, and kept the Carlisle front line at bay, and their keeper had very little to do. Lee Williamson looked a threat with drives from long distance and his crosses into the area caused the Cumbrians’ defence all sorts of problems. In all honesty, this is a game Sheffield should have been winning comprehensively. The contrasts in the two teams were massive. The Blades starting line up included ex-Premier League players and Internationals, many of whom can probably play at a higher level. The fact that they couldn’t kill off the game (especially with Cresswell’s chance in the dying minutes), could start to show later on in the season. On another day, Carlisle may have grabbed an equaliser, and to be in contention for promotion, the Blades will have to finish off their opponents. I wish United all the best for the season, and can definitely see them in contention come May, See you on January 2nd! I think Mark has summed up the game quite well. It was a lot closer than it should have been, at the end of the day Steve Simonsen didn't make a save of any note throughout. Too often both sides let themselves down in the final third when the ball into the box was poor quality. In the midfield it was a scrappy affair, with Doyle and Montgomery again failing to impress for the home side and ball retention poor. Former-Blade Paul Thirlwell, alongside James Berrett and Liam Noble, worked hard harrying and hassling, but there was a lack of quality in the central area all round. The best of the chances that fell to Carlisle fell to Lee Miller, but the shot just before half time was sliced into the side netting when he could have tested Simonsen. Miller was billed as the star man in the Blades programme, but offered little up front for much of the match. In a 4-3-3 or 4-3-2-1 system, he needs to be holding the ball up much better and bringing Jon Paul McGovern and Rory Loy into the game more than he managed to today. It was surprising seeing McGovern play so narrow, then again he always frustrated me in his failure to frequently beat his man and get to the by-line in his loan spell at United 8 or so years ago. He delivered a couple of dangerous balls second half as Carlisle looked more threatening, the introduction of Zoko adding zest and creativity lacking in the midfield prior to that point. With a willingness to run at the opposition; Zoko's runs, combined with a failure to properly clear lines, left the Blades scrambling in the closing stages. It did make you wonder why Zoko wasn't introduced earlier or even started, but reading tweets since suggest he is one of those players who is better used off the bench and rarely delivers from a starting role. I am not one to criticise referees, but I thought Phil Gibbs was poor today. Decisions angered both sides, with free kicks given for soft challenges and inconsistency in his use of yellow cards. I have to say I didn't see the incident Mark refers to in the build up to the corner from which United scored. I guess that is why these articles are good, different perspectives of opinion from opposing fans and different perspectives on incidents from sitting at opposite ends of the pitch. It is fair to say that there were similar incidents at our end, the free kicks subsequently awarded could have been better used in a more threatening manner by the Cumbrians. The Blades have played better and drawn or lost games this season. I am delighted with three points, a clean sheet and we will just gloss over the match. With all of the teams above the Blades winning, we needed to stay in touch. Mark's point about our failure to kill off the opposition is a fair one and it is something that has bitten us on the backside in recent weeks. It also added to anxiety levels, which again transferred from the stands to the pitch in the latter stages of the game. Overall, I think today's starting positions are a fair reflection of where both teams will find themselves, even if today's performances did little to vindicate it apart from the differential in the teams capabilities. Given the squad Greg Abbott has assembled, should Carlisle fans expect any better? Based on what I have seen of other teams this season, they shouldn't. There are teams with better starting XIs and squads. It also appears that the Cumbrians lack that one off player who could change a game. They are a steady hard-working collective, lacking spark that Zoko briefly gave them. Before today Carlisle were just 3 points behind the Blades, now it is a 6 point gap, but only 2 points to the play off positions. Maybe fans of both sides need to appreciate the positions they are in and the job that their respective managers are doing. After all, there can be few complaints. Can there?! I don't think it's the lack of a top six finish that has split fans over Greg Abbott. It's also his stubbornness to accept he can be wrong and his persistence in playing certain players who just aren't up to the job. John has only John Ward to compare to and even he didn't have the effect Abbott has had on splitting the fan base. His habit of talking the club down is also not particularly endearing. A nice piece but I think a bit of balance about Mr Abbott could have been better sought before alluding to a lack of play off place as to why is isn't universally loved by the Carlisle fanbase.